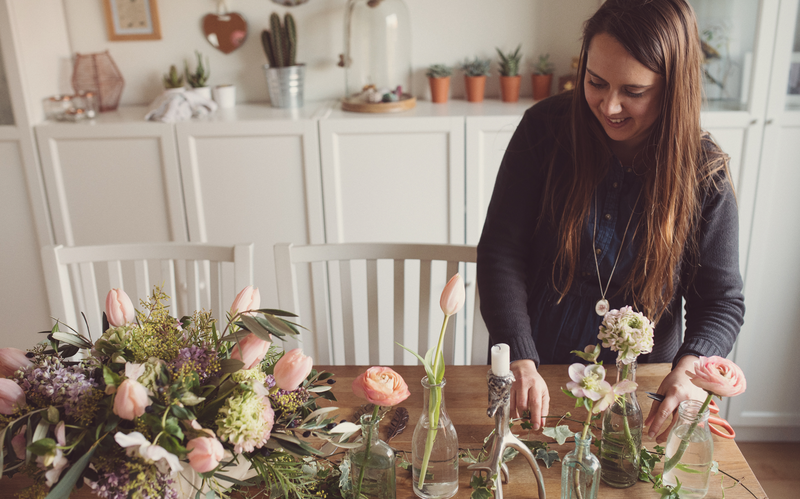 I actually fell into flowers by chance, it all started whilst away travelling through Central America back in 2008 when I had an epiphany that I wanted a career that allowed me to be more creatively hands on (up until that point I had worked in the fashion and homeware industry). I decided to take the plunge & study for a creative degree, originally enrolling for an FDA in design display but fate stepped in as the university discontinued the course. This left me wondering what an earth I would study instead? reevaluating the list of other course options available I spotted it… Floral Design and Events Management and thought to myself ‘that sounds interesting’. After just a couple of classes I had fallen hook line and sinker for the flowers! After three years of studying I achieved a first-class BA Honours Degree from Greenwich University who partnered with the prestigious Covent Garden Academy of Flowers. I set up Joanne Truby Floral Design in the wake of my graduation back in 2012 & I have never looked back! To me flowers come armed with a super power, which is never failing to evoke such happy emotions, & I feel very lucky to work with such naturally beautiful materials. I adore flowers & foliage too! The smell, the delicate petals and the wide array of colours, shapes and varieties available never ceases to amaze me! With a focus for design and details and a ‘thinking outside the box’ attitude when it comes to working with flowers, I’m inspired by such a variety of different elements around me; art, architecture, interiors, travel and of course nature itself. I would describe my style as natural and organic yet abundant with a romantic feel. I adore mixing different colours and textures together to create truly stunning florals and I love nothing more than seeing a design concept come to fruition on the day of a wedding or event after months of planning. When I’m not busy designing flowers I also love to write about them and have had the pleasure of guest blogging for a number of leading wedding blogs along with writing regular features for print magazines including Wedding Flowers and Accessories and Perfect Wedding sharing our expert knowledge and guidance on all things flower related. In 2013 we were shortlisted for the Hitched break through florist of the year awards and in 2016 we were a regional finalist in the Wedding Industry Awards along with being a finalist in the 2017 UK Wedding Awards for best wedding florist. When I’m not knee deep in flowers I love to travel and explore new places it’s often where I will find inspiration for new ideas and concepts. I also love to be outside with nature and enjoy going for long walks (even better when a lunch or tea and cake stop is involved too!) Don’t ask me what my favourite flower is, I have so many! I can be a bit fickle as this often changes depending on the season but if pushed I would have to say sweet peas for their ruffled shape & incredible scent and peonies and ranunculus as they are just so pretty!